H&H Bowe Limited, the H&H Group's specialist Chartered Surveyors and Land Agents have developed an on-going relationship with Young Farmers in Cumbria and the North of England. While many young people struggle to find work, the company has taken on several graduates and school leavers in recent years. So far the combination of a farming background, agricultural education or an active involvement in Young Farmers seems to be a winning formula. Assistant Land Agents Tom Armstong and Matthew Bell both worked for the company whilst on the placement year of their Rural Enterprise & Land Management degree at Harper Adams. Tom’s family are farmers at Cross Fell House in Milburn and he is still involved with the livestock in his spare time. Matthew who is from Rosley near Wigton also helps the family on the farm which is mainly livestock with some cropping, wheat and barley. The tradition has continued this year with the appointment of twenty two year old Harper Adams graduate Rebecca Stafford who was again offered the chance of a full time position after impressing the H&H Bowe team during her placement year. Rebecca, who was brought up on the family farm at Ingbirchworth in South Yorkshire, has just moved to Cumbria to begin her role as Assistant Land Agent and is looking forward to joining the local branch of Young Farmers. By appointing young graduates on a regular basis, placement students and new employees can see how their own careers may develop. Craig Brough now 25, is a good example: the former Harper Adams student is now a fully qualified Land Agent having passed his RICS and CAAV exams. Brought up on the family sheep and dairy farm in Dalston, he is an active member of the Raughton Head Young Farmers where he combines his responsibilities as County Chairman with his role at H&H Bowe. He has also been instrumental in organising a Calf Rearing Competition in association with the company, part of a project which has raised over £10,000 for the Pride of Cumbria Helicopter, part of the Great North Air Ambulance fleet. 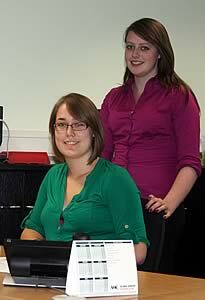 As well as employing graduate trainees, the company has a policy of giving opportunities to young people in the area. Nineteen year old, Caroline Fearon lives on the family small holding in Bothel near Wigton and attends events at her local branch of the Young Farmers in Greysouthen. After taking A Levels in Applied Business and Media, she decided to look for work preferring to combine part time study with gaining real practical experience. For the past four months she has been working as an Administrative Assistant.